Rebecca Weintraub recently returned to the Jewish day school she grew up in, although in very different role. As a Hadar education fellow, Weintraub found herself in front of the classroom instead of behind a desk at the Solomon Schechter School of Westchester, which she attended from eighth through twelfth grade. Now 25, Weintraub joined Hadar’s full-time learning program right after graduating from the University of Maryland with a Jewish studies degree, and spent two years helping to teach rabbinics, Tanakh, and theology to high school kids. For Weintraub, the experience paved the way for a life committed to Jewish learning and education. “It gave me the confidence to say that this is really what I want to be doing and to apply to rabbinical school.” After a year-long break, she’ll enter rabbinical school at Hebrew College in 2015. For her students, Weintraub’s guidance has helped them think about learning differently, thanks to the approach to learning taught at Hadar. She tells the story of a student she encountered while working in a 10th grade rabbinics class last year. The student was struggling with the work and was fed up. “‘I hate this, this is so dumb,’” he told her. But she pushed him forward. “I was able to explain to him that it was about logic and putting things together. I told him that they say that if you’re good at gemara, you’ll be a good lawyer, and he said ‘Oh, I want to be a lawyer.’” Her student returned to the text with renewed vigor. “To be able to show a kid that sometimes it’s not about the content but it’s about the experience of learning was really great,” said Weintraub. That style of learning is making in-roads at other New York area day schools. The relationship with Schechter Westchester is just one example of Hadar’s growing involvement in Jewish youth education. Hadar partners with three other New York-area Jewish day schools to provide education fellows; all our fellows each year assist in the classroom like Weintraub did. Hadar also recently formed a deeper partnership with Beit Rabban Day School, a day school on the Upper West Side of Manhattan, to help develop the school’s Jewish studies curriculum. Beit Rabban will serve as a “lab school” as Hadar develops a set of standards for Jewish day school education, determining the learning benchmarks day school students should take away from classic Jewish texts in early childhood and elementary school. 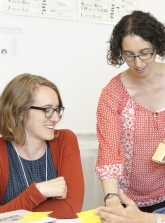 Our Jewish Educators' Institute, a week long learning intensive for Jewish educators.